March 7, 2016 – Sierra Nevada Corporation’s (SNC) Space Systems has successfully completed all in-orbit checkout procedures of the final 11 satellites in the ORBCOMM Generation 2 (OG2) constellation designed and built by SNC, culminating in the transfer of operations of these satellites from SNC to ORBCOMM. All 11 OG2 satellites have begun providing machine-to-machine (M2M) messaging, including Automatic Identification System (AIS) service, to ORBCOMM’s global customers. 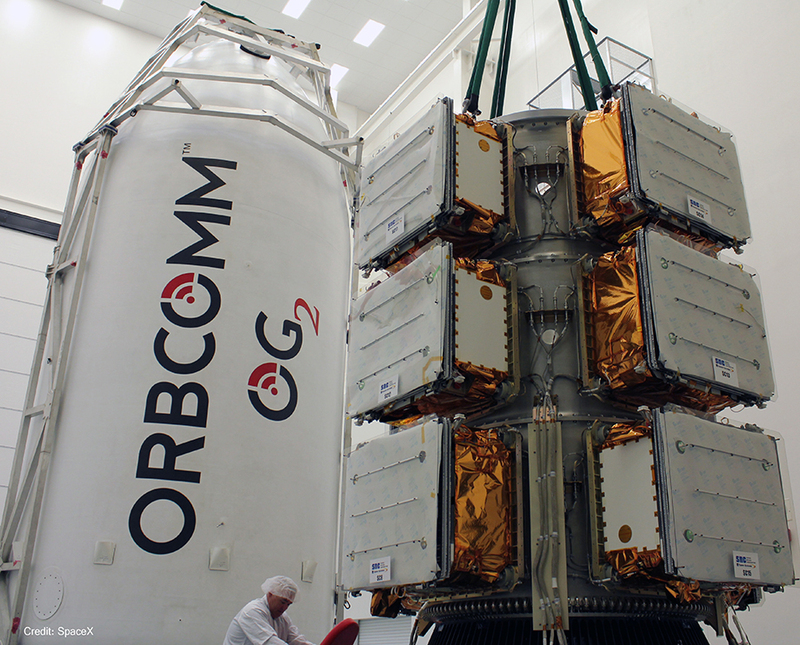 Derived from SNC’s SN-100 bus, the OG2 satellites are spaced within three separate drift orbit planes and the OG2 satellite fleet is now processing more than 60 percent of ORBCOMM’s M2M traffic. Drifting will continue until all 11 OG2 satellites are in proper phase. The satellites, which augment the first generation ORBCOMM (OG1) satellite fleet and the six OG2 satellites launched in 2014, were launched into low-Earth orbit on December 21, 2015 from Cape Canaveral Air Force Station in Florida. As the prime contractor and spacecraft bus manufacturer for this enhanced communication constellation, SNC was responsible for the design, development, integration and launch support services of the satellites. A key aspect to the success of launch operations and initial checkout was the seamless interconnectivity of SNC’s Louisville Satellite Operation Center (LSOC) in Louisville, Colorado with ORBCOMM’s Network Control Center in Sterling, Virginia, allowing for both engineering and operations teams to manage and monitor satellite performance during the detailed in-orbit testing. All OG2 spacecraft are based on SNC’s flight-proven SN-100 satellite bus, which can be tailored to support a variety of applications, including communication, Earth observation, weather and space science. The SN-100 utilizes a modular payload deck with the ability to be rapidly integrated and tested using highly-automated scripts to test all functions. This allows the baseline satellite to be quickly and cost-effectively configured to meet the needs of many customers.